The largest species of Giant Amazon Waterlily we grow at the gardens is named the Victoria Longwood (hybrid) Waterlily. This giant is distinguished by its massive leaves (lily pads), which can reach well over 2m in diameter. The leaves can get so large, it’s possible for a leaf to support the weight of a child or even a small adult. Warning – We don’t allow visitors to sit on the lily pads as they are quite fragile and covered in razor sharp spines underneath. The Victoria Longwood (hybrid) Waterlily is actually a cross between the world’s two largest waterlily species, the Victoria Amazonica Waterlily and the Victoria Cruziana Waterlily. It’s prominent parent, the Amazonica Waterlily is native to the tropical regions of the Amazon river basin in South America. The giant waterlily is distinguished by its massive leaves that can expand to over 10 feet in diameter. The leaves (lily pads) start as pointy heads that expand very fast, up to two inches per hour, meaning you could literally watch them grow. Under the surface, the leaves are red and have sharp spines that defend the plant from herbivorous fish. The species’ flowers are huge and up to 40 cm in diameter. The second variety of Giant Amazon Waterlily is the Victoria Cruziana Waterlily, which is slightly smaller than the Amazonica Waterlily. The plant is native to the subtropical regions of South America and grows in a slightly cooler habitat to its cousin. 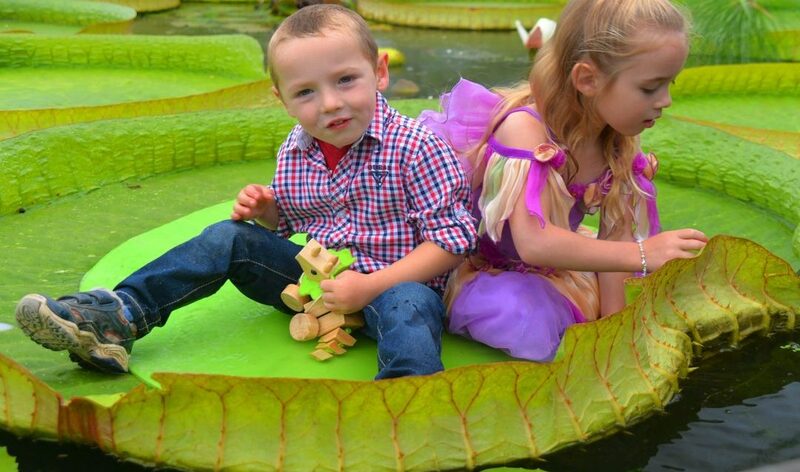 The Cruziana is still a spectacular plant and produces very large lily pads that reach 1.5 – 2 metres in diameter. The leaves are slightly different to the Amazonica, featuring higher sides and a greener appearance on the underside. Like it’s cousin, the Cruziana’s leaves and stalks are also covered in razor sharp spines and it produces very large flowers, up to 30cm in diameter. In the summer of 2015, the Cruziana Waterlily produced the largest lily pad ever seen in Australia. It measured a whopping 1.75m in diameter. Maybe this year it will be even bigger! Mr Charles Winch was one of the world’s foremost breeders of tropical waterlilies breeding over 600 different hybrids signified by their large colourful flowers and amazing variegated leaves. On display is a selection of his most spectacular varieties. AUSTRALIAN NATIVE HOUSE This greenhouse holds a small but prized collection of native lotus and waterlilies from the tropical regions of Australia. Some of the waterlilies are very rare and range in colours from blue, purple to white. Also, on display is two types of native lotus. Many people don’t realise lotus are native to northern Australia and cover many lagoons in across W.A., N.T and Queensland. Our tropical house is a special place full of rare and wonderful plants that owner Geoff Cochrane has collected from Australia and the world. The ponds contain tropical waterlilies including the Egyptian Blue Lotus waterlily that comes from Nile River system (the only one in Australia). Another feature is the spectacular night blooming waterlilies that open on cloudy days when other flowers struggle to open. And the terrestrial garden beds contain an array of unique tropical plants including palms, vines, creepers, figs, medinillas, heliconias, impatiens and ferns, all producing a jungle like effect. The “Crocodile Plant” or Euryale ferox is a type of very large waterlily, native to the tropical regions of Asia. This amazing waterlily produces massive spiny leaves up to 1m in diameter and covered in razor sharp barbs on both sides. The colour markings and texture of the lily pads also have similar characteristics to crocodile skin. This is why crocodiles have been known to hide under the leaves, because they offer great camouflage from unsuspecting prey. The flower is a very small and beautiful with delicate purple petals often seen protruding through a leaf. The seed is eaten extensively in Asia and commonly called foxnut or makhana. It’s believed the Chinese have cultivated this prickly plant (for food) for over 3,000 years.